Over the last few years Aki has quietly been building a name in the international jazz world both as a leader and as a sideman. With Amorandom, he delivers his most authoritative work to date. All music composed by Aki Rissanen and arranged by the trio. Produced by Aki Rissanen. Recorded at KallioKuninkala Studios, Järvenpää, Finland on June 29 & 30th 2015 by Mikko Raita. Mixed at Studio Kekkonen, Helsinki, Finland on December 14 & 16th 2015 by Mikko Raita. Mastered at Chartmakers West, Espoo, Finland on December 21th 2015 by Svante Forsbäck. There's a fluidity in his playing and a boldness in his composing that deserves widespread praise and real recognition for one of the finest young European pianists. Described by Downbeat as a ‘rising star around Europe, Amorandom is the work that will introduce Aki Rissenen’s startling new talent to a global audience. ‘The music on this album is based on an animation movie, to which I composed a soundtrack a few years ago, directed by Tuula Leinonen and animated by the “grand old man” of the Finnish scene, Antti Peränne. .. Although the original music has gone through many stages of transformation, you can still hear a cinematic flavor in it’. Rissanen maybe best known for his work with the Verneri Pohjola Quartet on Edition Records and ACT Music as well as with Dave Liebman on Ozella Music in Germany, yet he has made this album entirely his own. The quiet humility; the comradeship between long standing partners and friends; the classicism; a lyrical melancholy and distinctive rhythmical drive and finesse in his playing develop into a coherent statement. 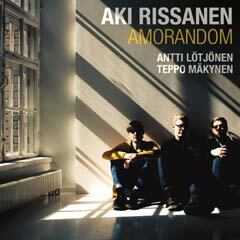 Amorandom is set to make Aki Rissanen the new European pianist everyone is talking about in 2016.